Tomoyo landed her first film role in 'Toki wo Kakeru Shojo' (The Girl Who Leapt Through Time) in 1983, in which she played the lead, as well as singing the theme song. She was selected from over 57,000 entrants in a nation-wide open audition, an achievement that paved the road for her highly successful career as an actress and singer. 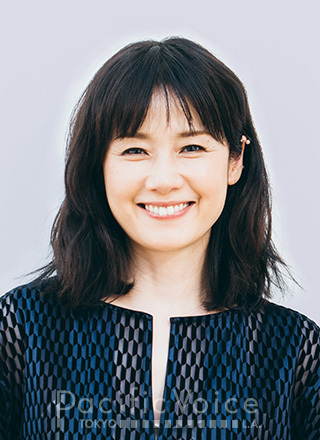 She has recently appeared in critically acclaimed works such as 'Sayonara COLOR', Kazuo Kuroki's last film 'Kamiya Etsuko no Seishun', the NHK serial ‘Ohisama’, and the NHK drama ‘Kami no Tsuki’. As a singer, she has released numerous albums since her debut in 1983, many of which were collaborations with Keiichi Suzuki during the 90s and 00s. She was also the first Japanese artist to work with renowned Swedish producer Tore Johansson, and led an all-Swedish band to coincide with the tours for the albums on which they worked together, an endeavor that drew in a whole new group of fans. In 2007 she celebrated her 25th anniversary as a singer with the release of a new album entitled 'music & me', produced by Goro Ito. Her solo album, 'eyja' was released on 2009, and 'noon moon' was released on 2014. She also became a member of Yukihiro Takahashi`s latest outfit pupa, a six-piece band. Tomoyo is currently active in a broad range of fields, including working as the narrator for a documentary program.